Make a container for data ggplot. Use the quakes data.frame: data = quakes. 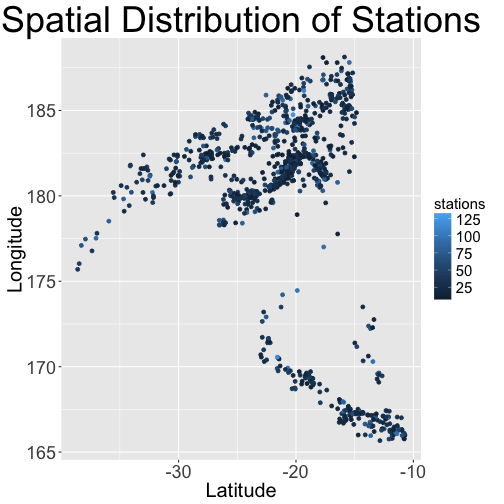 Map certain “aesthetics” with the aes to three different aesthetics (x, y, z) to certain variables from the dataset lat, long, stations, respectively. Add a layer of geometric things, in this case points (geom_point). Implicitly, ggplot2 notes that all 3 aesthetics are continuous, so maps them onto the plot using a “continuous” scale (color bar). 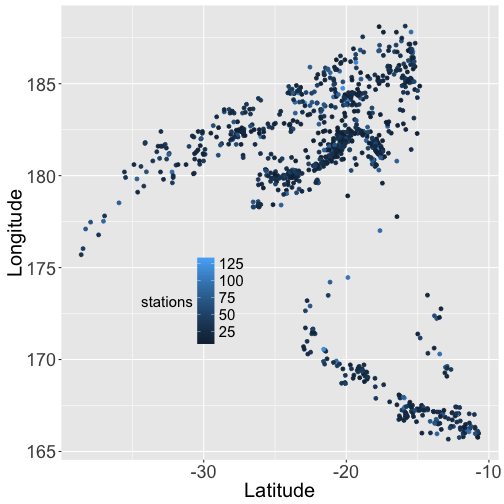 If stations were a factor or character column, the plot would not have a color bar but a “discrete” scale. Now, you can simply call print(g) to show the plot, but the assignment will not do that by default. 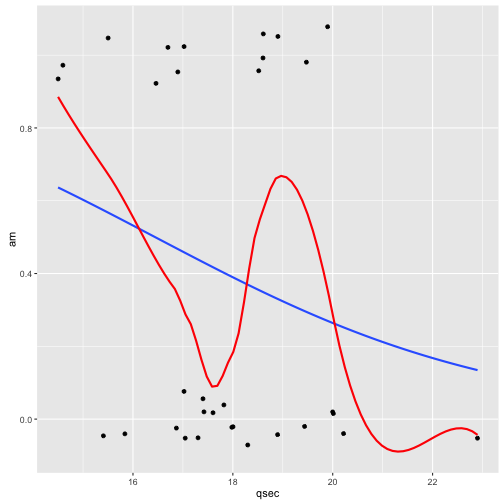 If you simply call g, it will print/show the object (as other R objects do), and plot the graph. One of the most useful ggplot2 functions is theme. Read the documentation (?theme). There is a slew of options, but we will use a few of them for this and expand on them in the next sections. We can use the text argument to change ALL the text sizes to a value. Now this is where users who have never used ggplot2 may be a bit confused. The text argument (input) in the theme command requires that text be an object of class element_text. If you look at the theme help it says “all text elements (element_text)”. This means you can’t just say text = 5, you must specify text = element_text(). 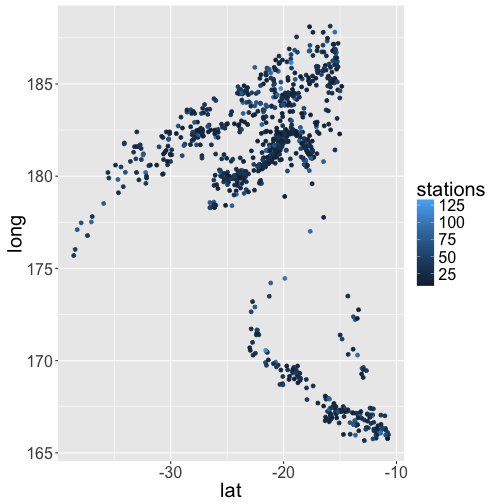 Now, we still have the plot g stored, but we make a new version of the graph, called gbig. We want to keep these labels, so we overwrote gbig. I will not reassign this to a new graph as in some figures for publications, you make the title in the figure legend and not the graph itself. Here, guides takes arguments that are the same as the aesthetics from before in aes. Also note, that color and colour are aliased so that you can spell it either way you want. That looks better for the legend, but we still have a lot of wasted space. I try to not do this as area has been added with no data information. We have enough space, but let’s make the legend “transparent” so we can at least see if any points are masked out and to make the legend look a more inclusive part of the plot. I have a helper “function” transparent_legend that will make the box around the legend (legend.background) transparent and the boxes around the keys (legend.key) transparent as well. Like text before, we have to specify boxes/backgrounds as an element type, but these are rectangles (element_rect) compared to text (element_text). 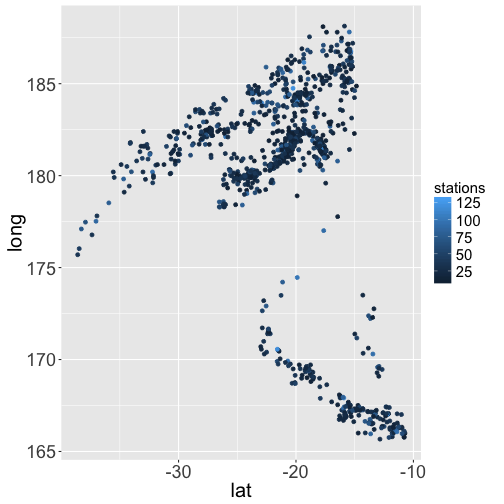 The last statement is not entirely true, as we could dig into the ggplot2 object and assign a different title.position property to the object after the fact. I agree that ggplot2 can deceive new users by making graphs that look “good”-ish. This may be a detriment as they may believe they are good enough, when they truly need to be changed. The changes are available in base or ggplot2 and the overall goal was to show how the recommendations can be achieved using ggplot2 commands. 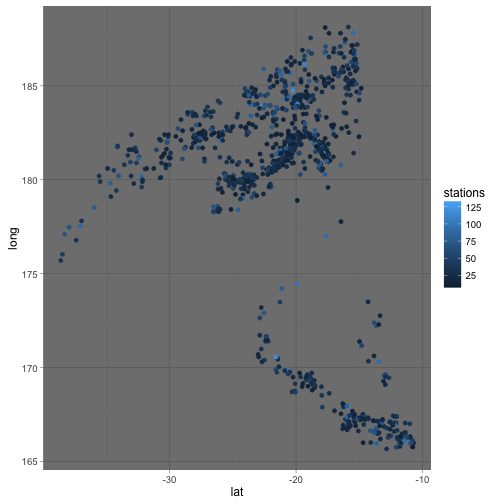 Below, I discuss some other aspects of the post, where you can use ggplot2 to make quick-ish exploratory plots. I believe, however, that ggplot2 is not the fastest for quick basic exploratory plots. 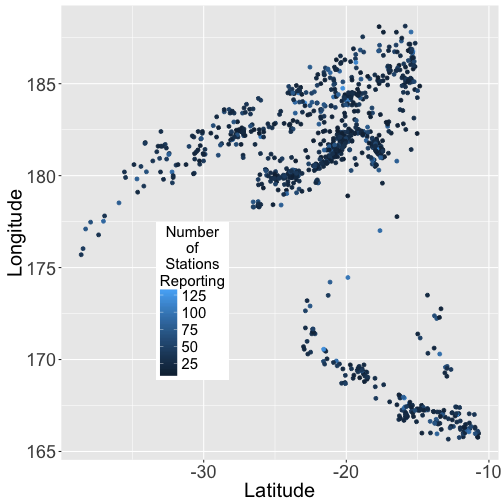 What is is better than base graphics is for making slightly more complex exploratory plots that are necessary for analysis, where base can take more code to do. I agree with Jeff that the purpose of exploratory plots should be done quickly and a broad range of plots done with minimal code. 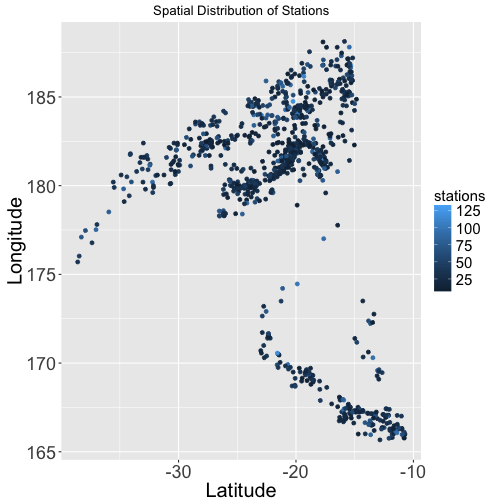 Now, I agree that plot is a great function. 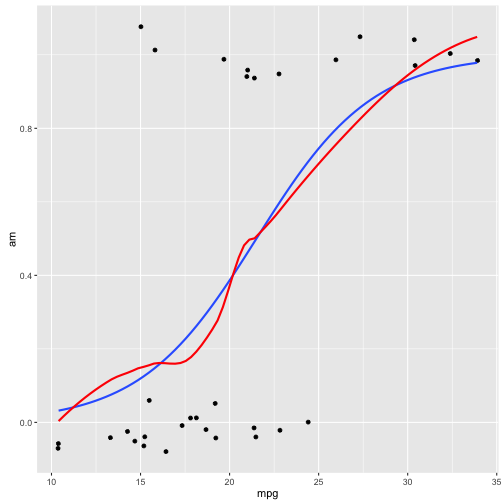 I do believe that you can create many quick plots using ggplot2 and can be faster than base in some instances. A specific case would be that you have a binary y variable and multiple continous x variables. Let’s say I want to plot jittered points, a fit from a binomial glm (logistic regression), and one from a loess. Here we will use mtcars and say if the car is automatic or manual (am variable) is our outcome. 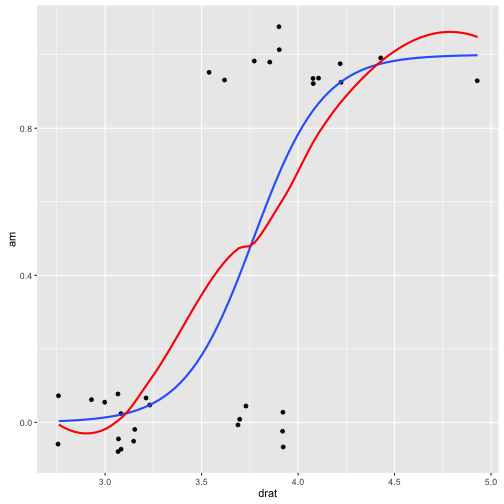 Yes, you can create a function to do the operations above in base, but that’s 2 sides of the same coin: function versus ggplot2 object. This entry was posted in bmorebiostats, Rbloggers. Bookmark the permalink. This is awesome! I wonder if you could post the full code snippet with the original ggplot2 code and the ggplot2 code that produced the final product, with the legend in the plot, the legend transparent, etc. Maybe with theme_bw()? Also a gist here: https://gist.github.com/muschellij2/709b08acbbb9b6c5a85f for the image with theme_bw() all inclusive. the quakes plots look like maps. But why did you swap longitude and latitude? I wanted to keep it consistent to what Jeff plotted in the previous post. One thing you might like: all the themes I know of (at least all the built-in ones) have `base_size` as an argument. Thus rather than forcing all the text to the same size with `theme(title = element_text(size = 30))` you can set just use `theme_grey(base_size = 20)`. All the text will be bigger, but relative differences in size (say, title larger than axis tick labels) will be preserved. You can use `rel()` for additional customization of text sizes relative to the base size in subsequent `theme(element_text())` calls. Thank you so much for your step by step explanation. 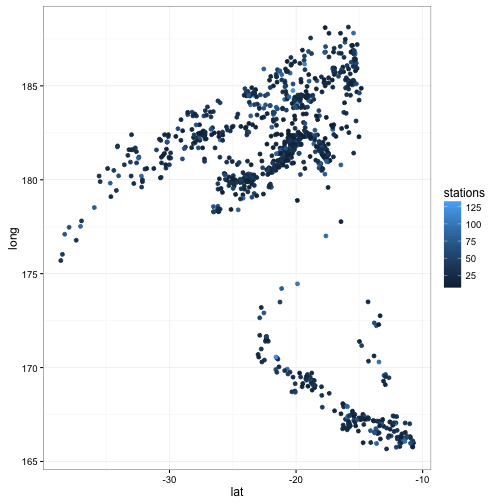 As a baby learner on ggplot, things got clearer now! Good tutorial! 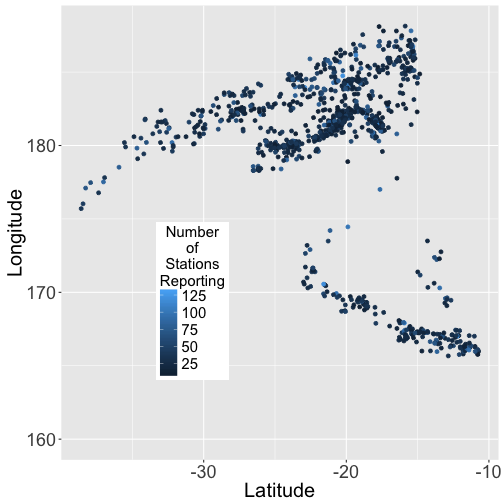 You mentioned using base::plot for quick exploratory plots. 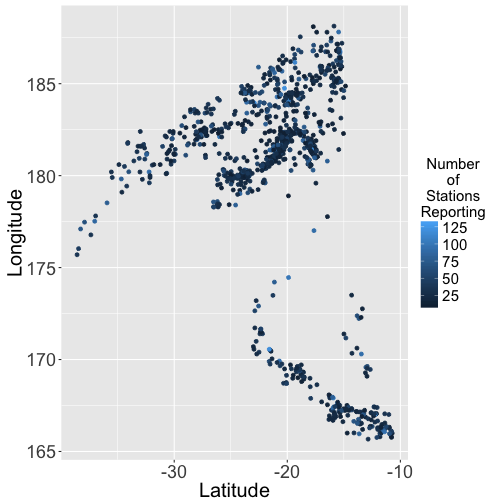 Explore qplot for the quick ones; it’s part of the ggplot2 package. 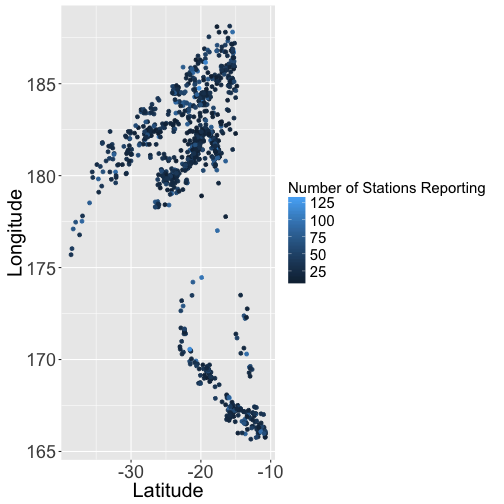 I like to use the labs() function for axis labels and title. You can also set the legend title there, e.g. In the mtcars data set the variable ‘am’ is the transmission type. The number 0 is automatic; the number 1 is manual.